An electronic device that handles the problem of lead-sulfate build-up. It attaches directly to a battery or battery system and keeps them from losing capacity and life due to the main cause of battery failure: the buildup of lead sulfate. There are different models for different sized battery systems. Call 1-866-301-8835 or visit the Dealer Locator to find the dealer nearest to you. What does the BLS do? "I can't say enough good things about your product. I bought a used golf cart with inexpensive 2nd hand batteries that were performing poorly. I bought one of you devices from a local dealer. 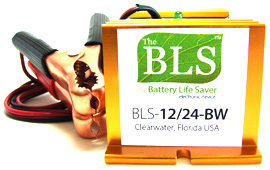 At first it did not appear to do much, around the second month of using the BLS, the batteries took half the time to charge and they lasted twice as long."